Nowadays the most convenient and simplest way to receive VLF – signals is using a PC. If a PC with soundcard is already available, it is also the cheapest method. You need only a coil (as coil you can use a roll of insulated wire, the electrical data of the coil are very uncritical), a cable with a length of at least 1metre and a plug for connecting the cable to the input of the soundcard (the necessary software is as free- or shareware available in the internet). Together this device costs you only approximately 10 Euro! Since cables with soldered plug for all kind of soundcard entrance sockets can be bought readily you only have to solder the coil to the free end of the cable in order to get a VLF – aerial for your PC! Another advantage of VLF – reception with a PC is, that you can in opposite to a conventional receiver examine multiple signals simultaneously. In principle it is possible to analyse all signals in the frequency range between 0 Hz to 22.05 kHz ( respectively 24 kHz) at the same time with your device! 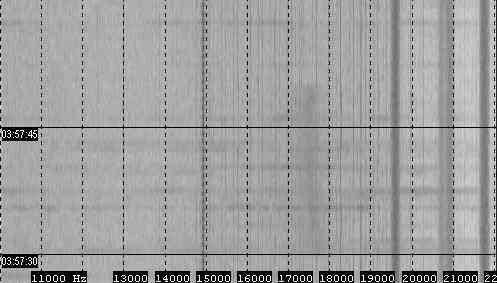 Further you can record all received signals -either as wav – file-or as spectrogram in form a bitmap or jpeg. This process can be easily automated, so you need not to be at your computer and wait for interesting signals! But using a PC as VLF – receiver has two disadvantages: first you cannot receive (with the customary device) signals with frequencies above 22.05 kHz (respectively 24 kHz when your hard- and software allows sampling with 48 kHz), second and this is more important, the computer and its peripherical device are sources of disturbing signals. Especially the monitor of a PC is a powerful source of interference in the VLF – range! 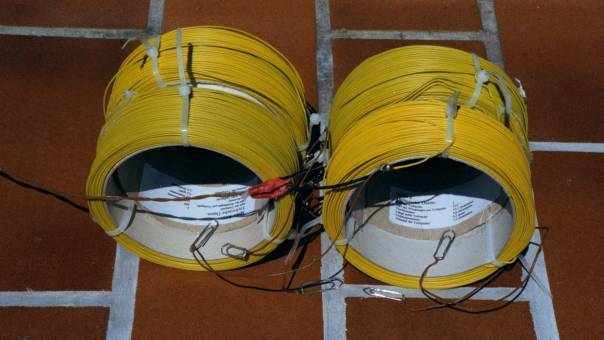 As aerial I use an inductive aerial, which consists (at the moment) of a serial connection of 2 coil units. Each of these coil units consists of 2 identical part coils. These part coils are rolls of insulated copper flex and can be bought ready – made in an electronic store, so there is no work necessary to coil them. Originally they are designed as a storage for copper flex and not for a usage as inductivity or electromagnet. The coil units are laid in that way on the floor of my room or of my balcony, that their axis show in the desired direction ( e.g. north – south or east – west). This orientation of the axis of the coil units is very important, because it shows as all inductive aerials a strong directional effect. (In the description of my spectrograms you will always find a giving in which direction the axis of the coils showed). My aerial system grew with the time. At the beginning I used only one wire roll, then two and at the moment I use four. In normal operation a serial connection of all four part coils is used, but I can for test purposes short – circuit each part coil individually by the help of paperclips, which are connected to the connection of each part coil. The aerial is directly -without using a preamplifier- connected with a 2 metre long unshielded twisted – pair cable with the line – input of my PC. My PC has a Pentium – III MMX processor with a beat frequency of 500 MHz. It uses a Windows98 operating system. Its soundcard is a Sound Blaster Audio PCI128. Although this soundcard can sample signals with a frequency of 48 kHz, most analysis were performed until August 23rd, 2001 with 44.1 kHz, because analysis software for a sampling rate of 48 kHz was barely available until this day. At my reception site not much space is available. 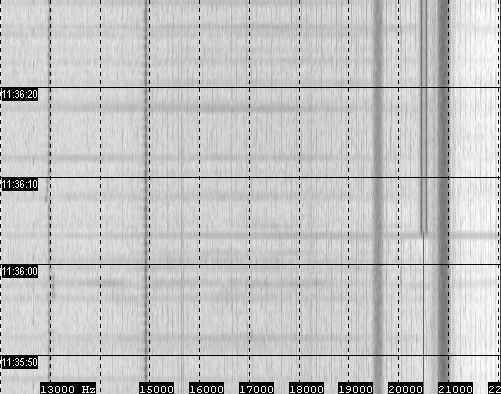 I make screenshots of the spectrograms with the monitor turned off and save these screenshots as graphic file. Therefore I use manually the "Print Screen" key or let this job do periodically by a special software. Of course I have no direct visible control of my spectrograms that I capture, but by automatic recording, I can record all signals when I sleep or when I am not at home. And at late night the disturbation level is lowest! 5 programmes are in use at my PC in the moment: Spectrogram Version 5.1.7, Spectrogram Version 6.2, Spektran beta 4, build 127, Spektran Version 1.0 and SpecPlus. Each of these programs has their advantages and disadvantage. Spectrogram Version 5.1.7 I use only to get a quick overview of the actual situation in the VLF – range. I do not make any recordings with it any more. Spectrogram 6.2. allows sampling with 48 kHz, but I think the way how Spektran shows the results is much nicer, so I use Spektran more likely then Spectrogram, although Spektran often leads to system crashes and Spektran 1.0, which allows also the usage of a sampling rate of 48 kHz, does not allow the simultaneous examination of a frequency range of more then 5.7 kHz of the VLF – range. For automatic recording in combination with all versions of Spectrogram and Spektran I use 2020, Version 2.2.7, but unfortunately after at the latest 125th screenshot the programme stops its operation (when you do not have enough space on your hard disk then it stops earlier! ), so I use for automatic long time reception, SpecPlus. This software allows in its actual version, which is since August 23rd, 2001 available, the usage of a sampling rate of 48 kHz and saving spectrograms in constant intervals as bitmap or jpeg – file. SpecPlus does not make -even after long time operations- the system crash. It can record data as long as your drive, on which the data are saved, is full. But 2020 is not obsolete when using SpecPlus. This programme can be used in order to convert recorded bitmaps – in jpg – files or to transform the recorded jpgs in jpgs of smaller file size. Since version changes very often, the upper mentioned versions can be not available any more. My major field of interest in reception of signals below 24 kHz are the man – made signals. I am interested in their strength, form, direction and the time when they occur. From these signals my major attention is on the signals of the transmitters. None of these transmitters is permanently on the air. So you do not wonder if you cannot receive one of the listed stations. Do not expect ever to receive all these stations simultaneously. If your hard- and software allows a sampling rate of 24 kHz, you can also receive the signal of DHO38 on 23.4 kHz, the transmitter of the German Navy located near West – Rhauderfehn, North Germany (Coordinates: 53N05 7E40). 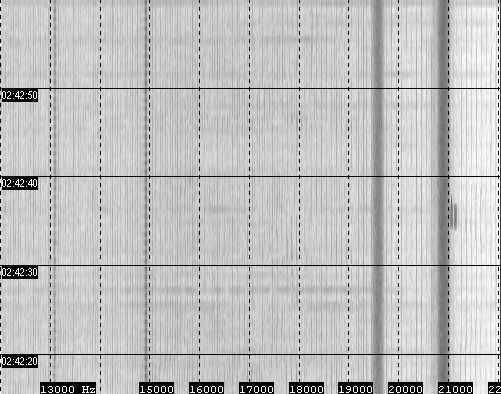 Further you can find sometimes on spectrograms showing the range between 22 kHz and 24 kHz a weak signal just below 24 kHz. It comes either from NAA in Cutler (USA), NSS in Annapolis (USA), NBA in Balboa (Panama), NLK in Oso Wash (USA) or NPM in Pearl Harbour (Hawaii). You will find on it the signal of GBZ on 19.6 kHz, of ICV on 20.27 kHz, of HWU on 20.9 kHz, of DHO38 on 23.4 kHz. Further you will find just below 24 kHz a weak signal which comes presumably from NAA or NSS, since these transmitters are from all transmitters working on 24 kHz closest to my reception side. A more detailed list of VLF – transmitters you will find on http://www.vlf.it/itulist/itulist.htm. Several signals from electrical device occur in the VLF – range. The most important one is the TV line scan base frequency on 15.625 kHz. This signal can be detected in a radius of several metres around every running TV – set. Other sources of VLF – emission are switching transformers and neon tubes. Their frequencies are very different and depend on the type and model of device. This is also valid for the VLF – signals of PCs. Concerning PCs another problem occurs, since a computer does not always emit the same signals in the same intensity. They can sometimes change their strength in a very uncharacteristic pattern. Because of this fact it is not always easy to find out, if a signal comes from your computer or not. In order to do this job, it is best for comparison to analyse the VLF – range with a second computer at the same time. Of course both computers should use the same software with the same settings and examine the same frequency range. Further attention must paid to, that the orientation of the reception coils of both computers is the same and that the aerial is more then 2 metres away from the comparison device (including its aerial). Otherwise its signals would be received. If a second computer is not available, disconnect or short – circuit the reception coil. Signals from external sources must then disappear! The most interesting signals in the VLF – range are the irregular signals. They can have their origin in a known or unknown source. VLF – transmitter generate, when they test their modulator, sometimes funny signals, which look like garlands or fishes. So did the transmitter Criggion at the end of June 2001. The axis of the reception coil was oriented in North – South – direction. Analysis software: Spektran, Frequency resolution: 22Hz. The axis of the reception coil was oriented in North – South – direction. Analysis software: Spektran, Frequency resolution:22 Hz. There are several time – signal stations in the former Soviet – Union which works in the VLF – range. These stations are RJH63 in Krasnodar (Russia), RJH66 in Bishkek (Kyrgyztan), RJH69 in Moldechno (Belarus), RJH77 in Arkhangelsk (Russia), RJH99 in Nizhny Novgorod (Russia) and RAB99 in Khabarowsk (Russia). These transmitters are not permanently on the air, but transmit alternately according to a complicate scheme on the frequencies 20.5 kHz, 23 kHz, 25 kHz, 25.1 kHz and 25.5 kHz. With a PC – soundcard you can only receive the signals on the frequencies 20.5 kHz and 23 kHz. For the reception of the signals on 25 kHz, 25.1 kHz and 25.5 kHz a special VLF – receiver is required. If for the reception only the soundcard of the PC is available, these transmitters are unfortunately not easy to identify, because they emit on the frequencies 20.5 kHz and 23 kHz only an unmodulated carrier. Such a signal can be easily confused with a jam signal, e.g. from a switching transformer. 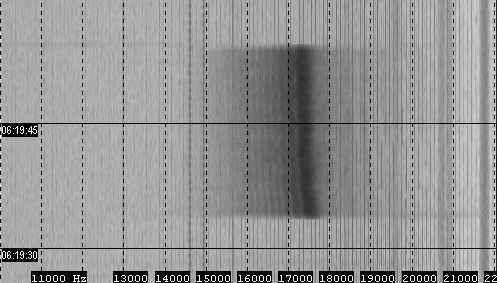 The best criterion to identify signals from RJH66, RJH69, RJH77, RJH99 and RAB99, is to search on the spectrograms for the end of the transmission. The transmission on the frequency 20.5 kHz is terminated 17 respectively 47 minutes after the begin of the full hour. The reception coil was oriented in East – West – direction. The time value is in Middle European Standard Time. Recording software was SpecPlus. On the frequency 23 kHz the end of the transmission takes place 11 respectively 41 minutes after the beginning of the full hour. On both frequencies the end of transmission occurs very suddenly. The beginning of the transmission of these signals takes place for the frequency 23kHz 5 respectively 35 minutes and for the frequency 20.5 kHz 11 respectively 41 minutes after the begin of the full hour. It is only weak distinct on the spectrograms, because the intensity of the transmitted carrier grows slowly and continuously. Because of that it can be not always detected, if local sources of disturbance are present. The signal of RJH63 is somewhat easier to identify. This transmitter emits the days, on which it is running, between 11h 36m UTC * and the end of the transmission at 11h 40m UTC* a frequency modulated signal with a shift of 300 Hertz. The reception coil was oriented in North – South – direction. Unfortunately the signal of RJH63 on the frequency 23 kHz is also unmodulated. It can be best identified by its sudden end at 11h 31m UTC*. Like the others VLF time – signal transmitters of the former Soviet Union, the beginning of the transmission on 20.5 kHz and 23 kHz is also only weak distinct for RJH63, too, because the strength of the signals at the begin of transmission (11h 26m UTC* for 23 kHz and 11h 31m UTC* for 20.5 kHz) grows only slowly. Some VLF – transmitters mentioned in the tables as http://www.vlf.it/itulist/itulist.htm.are only very rarely on the air. 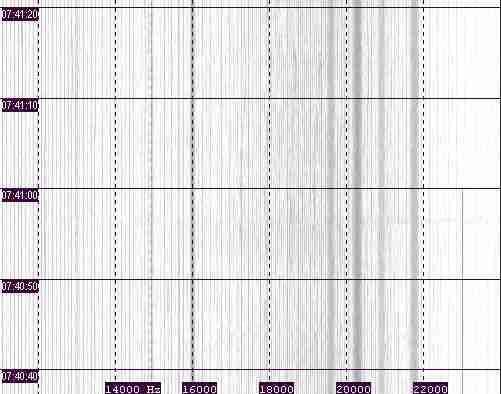 Two further well – receiveable VLF – stations which are only exceptionally in service are UMB (located near Rostov, Russia) on 18.9 kHz and ICV (Location: Tavolara, Italy) on 20.27 kHz..
(The standard frequency of ICV is 20.76 kHz where it can be received very often). But do not forget, in this chapter the situation of summer 2001 is described. Short term – changes in transmitting activity are always possible, so a transmitter which is at the moment very rarely on the air can be very active at a later point of time! The axis of the reception coil was oriented in North – South – direction. Analysis software: Spektran, Frequency resolution: 22 Hz. The axis of the reception coil was oriented in East – West direction. Analysis software: Spektran, Frequency resolution: 22 Hz. According to ITU lists the frequency 17.8 kHz is allocated to transmitters in different locations in the USA and the frequency 17.9 kHz to a transmitter in the eastern part of Russia. But, if the recorded signal comes from one of these transmitters, why is it much stronger then the signals of GBR, GBZ and HWU? The axis of the reception coil was oriented in East – West – direction. Sometimes in the range between 17 and 18 kHz short pulses with a duration of approximately 20 seconds occur. They have a big bandwidth and sometimes an enormous intensity. The reception coil was oriented in East – West – direction. The time value is in Middle European Standard Time. Recording software was SpecPlus. The scroll – interval was 0.01s, frequency resolution: 0.6729 Hz. All these pulses look like the pulses shown in the spectrograms above. Because weak pulses are more frequently then strong pulses, I suppose that both types originate in the same way and come from sources, which are in different distances of the reception side. The question is: what are these sources?